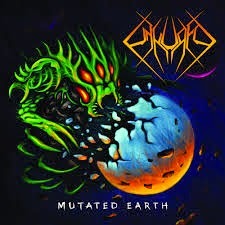 Ohio's UnKured debut album, Mutated Earth, brings Old School back... to really modern Progressive Thrash Metal. Although the trio promises old Thrash, it sounds a lot more like Revocation than Metallica, or even modern acts like Crisix. The vocals are growled, the guitars arpeggiated, and the drumming complex. Nevertheless, the album does have a very "Thrashy" feel, and most importantly, packs punch after punch . The title track starts this work fast and angry, just the way I like it. Although there is a constant variation in textures, the song just keep the momentum going at all times. I had to start headbanging. A Call From Eternity is a prog-y instrumental track, evolving from a funerary march to a melancholic guitar duet. They Live, We Sleep, reawakens the fury with bass-heavy grooves followed by more brain crushing Thrash. The next two tracks, A World At Dusk, and Into Crumbling Ruin, come closer to Death Metal - they could sneak into a Torture Squad album without raising many eyebrows. Cells brings back the modern feel, as does the next track, Anti-Terraforming. Twisted and Warped twists (ha!) the end with more complexity, held together by some serious headbanging-inducing moments. UnKured has put together an amazing work; Mutated Earth is a modern classic. It brings a lot of markers from the Old School Thrash we grew up to, but it also shows that Thrash Metal is still a living, evolving genre.